Below are my thoughts from the daily Bible reading of the West Side Church of Christ. Today’s reading comes from Isaiah 64-66. Before reading I invite you to pray and asked God to speak to you as you read his word. Also above in the tabs is a link to the Bible reading plan. I was never good when it came to molding things out of clay. Art really is not my thing. I can take a lump of clay and roll a pretty mean snake, but beyond that, I just lack the talent. It’s not for trying; I have given it my best effort. In middle school art class I tried to make a dragon, but the proportions were completely off, and the only thing right on it was possibly the green color. I thought it would be fun to sit down at the pottery wheel, but every time the urn began to form it would collapse back down. (Still the romantic scene of me and Crystal together at a pottery wheel sounds like fun!) The most memorable thing I made was a clay pot out of snake rings piled on top of each other and then smoothed over. It is midnight blue and black in color and sits in my attic today. Now the question is are you allowing the potter to work? 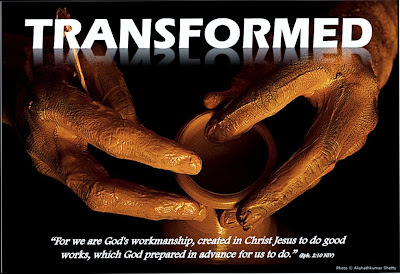 Are you allowing God the Father to mold and shape you into the beautiful creation He desires you to be? Are you praying, asking God to be the potter of your life? I hope so, but you must know it takes giving up control. It takes allowing God to take you through things you might not necessarily get or understand. It takes you allowing God to put you through the pressure of His hands and through the finishing fire. It may not always be pleasant, but what comes out on the other end is magnificent. My pottery projects were disasters, but my hands are not the hands of a master potter. God’s hands are the hands of a master potter, and his works are magnificent!